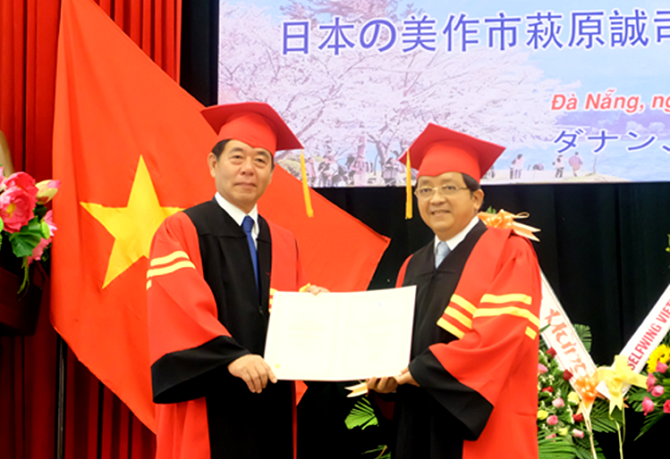 Good news and pride to the University of Da Nang (UD) and those who have attached a deep strategic partnership between Vietnam and Japan as on October 4, 2018, Nagaoka University of Technology (NUT) awarded the "Honorary Doctorate" to Professor Tran Van Nam – Chairman of the Vietnam-Japan Friendship Association of Da Nang City, Former President of UD for his contributions to the success of NUT, contributing to the development of effective cooperation between UD and NUT for nearly 15 years. 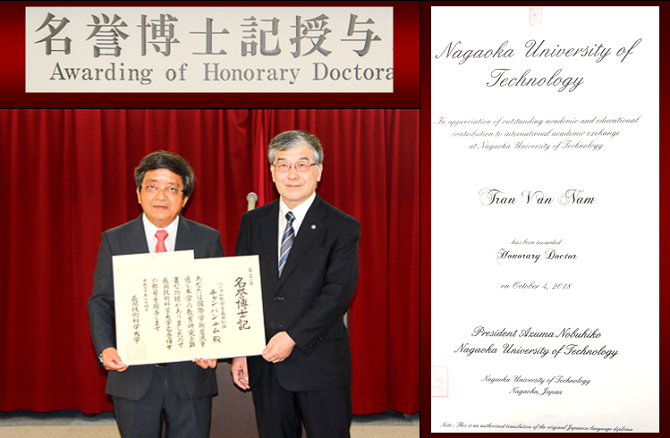 This was the second time Professor Tran Van Nam was honored by a prestigious Japanese university after the first time (September 2014), the first Vietnamese to be awarded the "Honorary Doctorate" by Yokohama National University. This honor is more significant on the occasion of the 45th anniversary of the establishment of Vietnam-Japan diplomatic relationship (21/9/1973-21/9/2018). On this occasion, UD would like to send to Professor Tran Van Nam the best wishes and express special thanks to Nagaoka University of Technology and introduce some memorable milestones on the long-lasting way of contributing to the "bridge" of cooperation in educational, cultural and friendship between Vietnam and Japan between UD and Japanese partners of Professor Tran Van Nam. 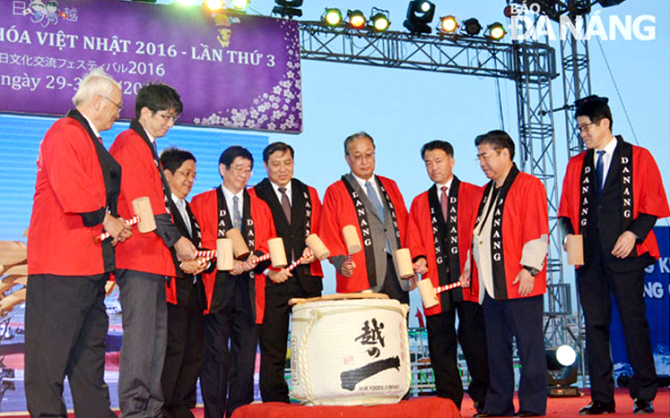 In 2005, as a Rector of University of Science and Technology – the University of Danang (DUT), Prof. Tran Van Nam, connected the DUT and NUT by setting up the Vietnam-Japan Joint Training Program for construction engineering ("3 + 2" and now "2.5 + 2"). This was one of the first international linkages that laid the foundations for the "Advanced Program" of the UD in particular, Vietnam higher education in general (along with the PFIEV was born in 2004 and Vietnam-American advanced program was born in 2006). Currently, there are 08 UD’s doctoral students studying in NUT by the MEXT Scholarship. From 2006 to 2010, Prof. Tran Van Nam founded the cooperation with Yokohama National University (YNU) by signing a comprehensive cooperation agreement between DUT and YNU (2008), UD and YNU (2011) to develop cooperation in training, research in the fields of mechanical, construction and architecture engineering. 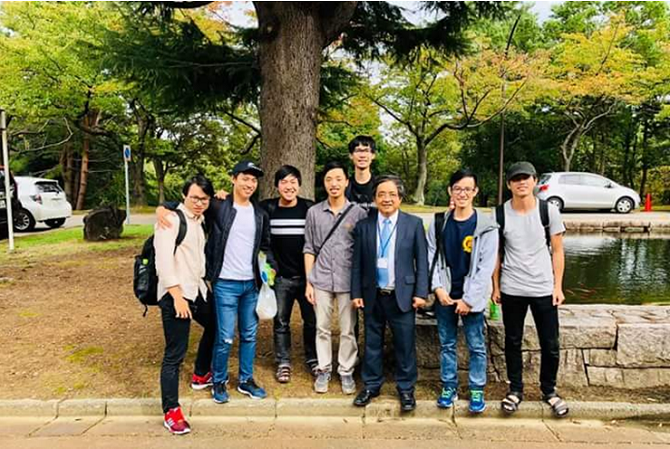 During this period, under the direction and connection of Professor Nam, there were 10 international seminars, more than 60 lecturers, students motilities and 04 PhD students to be successfully trained and defended Ph.D. thesis at YNU. In June 2011, with awareness and constant concern for the development of scientific cooperation on forecasting, prevention of risks and natural disasters between localities of the two countries which are frequently at risk of typhoons, earthquakes, tsunamis and climate change, Prof. Nam coordinated and best supported for the establishment of the "Center for Risk Management and Safety Science" at UD. This was a step forward in the development of scientific research that shows his vision and heart of an authentic professor and scientists, since there has been more valuable research contributing to science and its application to community practice. .
With a keen mind and a strategic vision of international cooperation as a "lever" for sustainable integration in the context of globalization, in 2009, together with Professor Bui Van Ga - former Vice Minister of Education and Training (MOET), Professor Tran Van Nam initiated and implemented the policy of granting "academic title and honors" to foreign scientists, politicians for outstanding contributions to science, to the community and to the development of UD. So far, UD has donated and honored "Honorary Doctor" and " Honorary Professor" to 03 Japanese scientists, namely: Professor, Dr. Hitoshi Yamada - Vice President of Yokohama National University (22/3/2016); Hagiwara Seiji - Mayor of Mimasaka City, Okayama Prefecture (26/7/2016) and Late Prof.Dr. Yoshiaki Takahashi - Chuo University (16/02/2017). For the development of the human resource, the "spans of bridge" of Professor Nam connected, "stepping up" many young cadres, faculty and scientists of UD to the training, research and job development in the leading universities in Japan through dozens of MOU, MOA that Professor Nam acted as the chair, signed and directed implementation. Many valuable scholarships from business associations, business communities (Japan Business Association - JBAV, JFE Steel Group ...) have regularly awarded hundreds of scholarships to the excellent and disadvantaged students of UD to rise in learning and life. Prof. Dr. Tran Van Nam initiated the establishment of "Japanese Center in UD", organized many Japanese language training courses (free of charge) for students with the support of businesses of the two countries. It was also a place where students could get information of training, study abroad, student exchange and internship activities for students in Japan. In 11/2016, from the sponsorship of Sumitomo Corporation, we have implemented the model of "Japanese Culture Department" at University of Foreign Language Studies-UD with full equipment of listening, viewing, computer system, cultural objects, typical of the sun rises country. This created the environment and became the ideal "destination" for exchanging, studying culture and learning for lecturers and students. Under the direction of Professor Nam, the Faculty of Japanese-Korean-Thai was established at the University of Foreign Language Studies-UD (2007) and quickly followed the demand as the core of Japanese language and culture teaching for lecturers, students of UD as well as in the Central Highlands region. Professor Nam has harmonized education, science with culture, opened and developed comprehensive cooperation through education and people's external relations, especially as Chairman of Vietnam-Japan Friendship Association. Danang city (term 2014-2019). To date, Danang has had friendship relations with many provinces and cities of Japan such as Kawasaki, Sakai, Mitsuke, Nagasaki, Yokohama, Nagoya and Shunan, Kobe, Yaidu, Fukuoka, Mimasaka, Kitakyushu, Ohtawara etc. 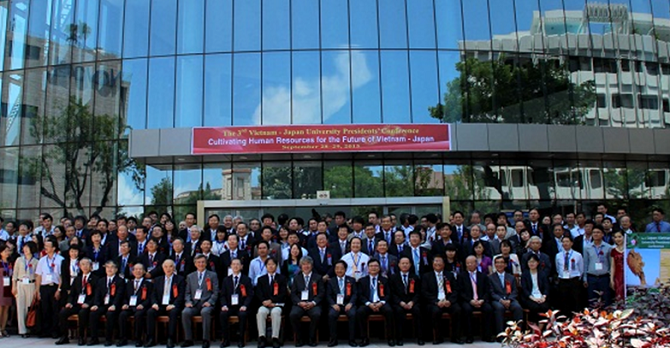 This deep cooperation has significantly contributed to the friendship between Vietnam-Japan Friendship Association. The "bridge" of education, science, culture and friendship that Prof. Tran Van Nam was the typical "pioneer bird" of UD connected UD, Danang city in particular and Vietnam in general with the prestigious universities, localities of Japan, firmed on the way of integration, development and contribution to strengthen the friendship and cooperation of the two peoples towards the future.